In light of the season 4 premiere of American Horror Story, I thought it would be relevant to glance back at the past three seasons of the show. Specifically I wanted to talk about American Horror Story: Coven in the context of the horror genre and in comparison to the first two seasons as well as to other works of horror. I don’t think I’m alone in my opinion that, although the third season had some interesting features, it wasn’t at all scary. The story created an interesting framework with the concept of modern warring voodoo and witchcraft tribes, but the final product didn’t deliver as a “horror story”. Despite a promising start, the third season overall lacked many of the aspects that make an effective scary story. The opening sequence alone is enough to creep you out; the combination of the eerie soundtrack and the dark imagery was promising. Even the first sequence of events led me to believe that we were in for a scary season. The first episode begins at Madame LaLaurie’s house (sometime during the 19th century) where we learn that the seemingly well-behaved and sociable lady of the house is keeping and torturing slaves in her house while using their blood as a poultice to preserve her youth. However, as the story went on, even by the end of that episode, that sense of creepiness was gone and it didn’t really ever come back. There are a few specific aspects that I think really detracted from the overall “fear factor”. To feel truly scared of something we must, at some level, feel helplessness; the oncoming danger must be a threat, not a competitor. In AHS: Coven, the main confrontation was not between protagonists and villainous characters, but instead it is a competition between characters of relatively equal power. In the context of a horror story, this takes away the fear created from the killer-victim complex. Vying for supreme is very reminiscent of a high school competition for prom queen. This chick-flick-esque plot reduces the whole story of Coven to a catty fight between girls, eliminating any notion of horror. In addition, no character in Coven was privy to more knowledge than the others; therefore no one was at an advantage. In AHS: Murder House, Constance had more knowledge about the house than Vivien and Ben; she was in control. The ghosts weren’t able to die and, as a result, they held a position of power over the living. In AHS: Asylum the patients were at the complete mercy of the asylum staff. The subjects of Dr. Arthur Arden’s experiments were defenseless against his will. The aliens were infinitely more powerful than the humans and could take them at will (for some mysterious purpose…. But that’s a rant for another time). In both seasons, there was a noticeable and long-lasting power difference between the characters. It’s present in most other horror films and usually manifests itself as some otherworldly ghost or spirit that terrorizes defenseless humans such as the curse in The Grudge. That extremely necessary dichotomy between victim and aggressor was completely absent in AHS:Coven. While watching a horror movie, we feel scared because we empathize with the main characters and so, their situation must be something that would scare us (namely, something that makes them helpless). We need to be scared of something terrible happening to these characters. The rules of AHS: Coven (established and changed as the show went on) allowed multiple characters to come back from consequences that should have been permanent. Myrtle, Madison and Zoe are all easily revived by other witches after their deaths. Although this is a skill mentioned in the series, the nonchalance and frequency with which it is used by the writers reduces any impact or worry that the audience has. Even though AHS: Murder House had characters coming back after death, the rules were very clear; if you died off the property of the house, you could not come back as a ghost. An example is Adelaide. There were no loopholes to allow her to come back as a ghost. Her death was finite for the remainder of the show. AHS: Asylum stayed true to this as well. All the victims of Dr. Arden’s experiments or Thredson’s rage had to deal with intense torture, pain and as always, death. If a character was abducted by one of these madmen, the audience knew that nothing good could come of it. The characters would not come back the same, if they even came back at all. These tangible consequences allow the audience to feel fear for characters since it is a set result. Most classic horror movies like Friday and the 13th and Nightmare on Elm Street have death as the ultimate consequence. Once a character is caught by the killer, they (almost always) die and never return. Without fearing for the fates of the characters, the real horror aspect of any show or movie is diminished. An important aspect of fear is uncertainty. Not knowing what fate awaits the characters that we have grown attached to is a sure-fire way to motivate fear and anxiety in the audience. Everyone has often heard that people are scared of the unknown. As clichéd as it is, it is also true. If we don’t know what to expect, our imaginations tend to create an image far worse than it actually is. This heightens the fear we have for the duration of the movie or show. In AHS: Coven, the motives of all the characters were known. No one character was mysterious or unknown. Each character’s powers and abilities were clearly established. This meant that there was no “fear of the unknown”. Losing this integral part of a horror story took away from the “fear factor” of season 3. AHS: Murder House and AHS: Asylum both had several aspects of mystery. Throughout the course of the two seasons, there were many unanswered questions and mysteries that we wanted to solve. There were glaring questions like “who is the rubber man” and “who is Bloody Face”, etc. In addition there were elements of confusion, of small things that didn’t add up. Sometimes, this feeling of uneasiness can be more effective than the big questions. In AHS: Murder House, Adelaide’s dialogue and presence created an unsettling atmosphere that furthered the feeling of something not being right. AHS: Asylum did this as well through the change in Sister Mary Eunice’s behavior. Her attitude changed and through that we sensed that something worse was yet to come. These little feelings add up to create a very disturbing environment for the audience. This technique is used effectively in many other horror movies. The best example I can think of this is when I was watching Jeepers Creepers with a friend. For the majority of the film the identity of the antagonist was hidden. The audience didn’t know if it was a serial killer, monster or anything else. Leaving the audience in suspense for a long time provoked fear, as a horror story should. As mentioned above, successful horror stories must make the audience worry for the characters. An integral part of this is liking the characters and following this, not wanting any harm to befall them. This protective instinct is attributed to the appeal of the protagonists. As a result, horror stories must have likable main characters in order to incite fear in the audience for these characters. The characters of AHS: Coven failed to make this connection with the audience. We didn’t care if any characters lived or died. This eliminated the fear that is present when any character is in a potentially life-threatening situation. Characters in AHS: Coven, such as Emma Robert’s character, too closely resembled a stuck-up cheerleader for anyone to feel any type of affinity for her. As well, Fiona was shown time and time again to be self-serving and cruel. With very few redeeming traits, these characters made it hard to feel any type of remorse or sympathy. On the other hand, both AHS: Murder House and AHS: Asylum had characters that we bonded with. Vivien in AHS: Murder House was a character that we felt a lot of sympathy for. As a housewife with an unfaithful husband and troubled daughter, we understood her life was already difficult. When the problems caused by the murder house arose, we hoped that she would overcome it. In addition, Lana Winters characters in AHS: Asylum easily made us root for her. Her goal (to expose the corruption at Briarcliff) was a cause that we wanted her to fulfill since we saw the atrocities being performed there. So, whenever an obstacle came in the way of this goal, we feared for her. Even in movies like Seven, the main character is amiable. Brad Pitt’s character was ambitious and motivated so he was easily liked by the audience. As the story went on, everyone was on his side. Creating a bond between character and audience ensures that everyone will fear for the fate of the characters that they love. What can we expect for Season 4? In its premiere episode, AHS: Freak Show managed to rectify some of the wrongs done by AHS: Coven. AHS: Freak Show successfully promised a threatening villain, sympathetic characters and a cause to root for. 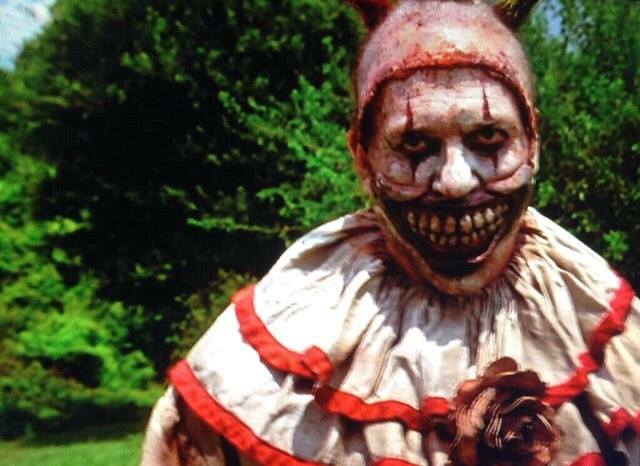 The horrific, nightmare-inducing clown is surely the antagonist for this season. Unlike AHS: Coven, the power difference between protagonist and antagonist is stark. The clown is a silent, gruesome killer who seems to only have a single intent; to kill. The equal playing field established in AHS: Coven is abolished and in its stead is a very distinct contrast in power. The aspect of mystery is also re-introduced in the premiere by the clown. The motive and identity of the clown is already something that the audience wants revealed. Not knowing anything about this character ensures that the anticipation will keep the audience intrigued and fearful. Also, AHS: Freak Show created several characters that we sympathize for. Seeing the oppression and discrimination against the “freaks” in Jupiter make the audience side with them. The audience senses injustice and wants the “freaks” to prevail against their oppressors. Overall, the premiere of AHS: Freak Show holds great promise. As an AHS fan, I hope it will not repeat the mistakes of AHS: Coven but will return to the effective horror story telling found in seasons 1 and 2.